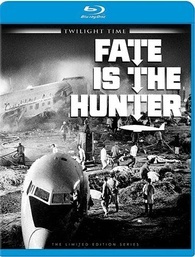 The 1964 mystery drama Fate Is the Hunter, concerning a commercial airline crash and the subsequent investigation into its cause, looks quite fine in Twilight Time’s new Blu-ray edition. It’s Fate’s striking black-and-white cinematography by Milton Krasner (All About Eve) that’s the strongest aspect here. The film itself, starring Glenn Ford (3:10 to Yuma) as the crash investigator and Rod Taylor as the doomed pilot, is a shaky combination of disaster film and mystery that doesn’t quite gel, its momentum regularly broken up by flashbacks that throw extended character studies into the mix. And the film’s climactic resolution is a bit too pat even as it heaps on the melodrama. 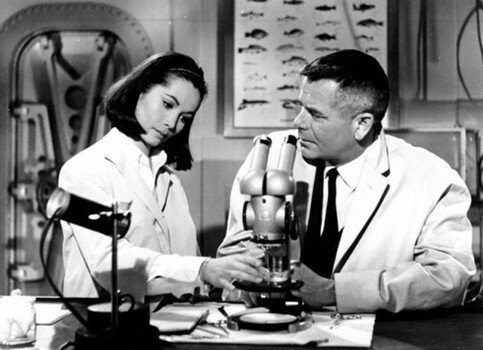 Nancy Kwan and Glenn Ford star in Fate is the Hunter. The more substantial and engrossing film on the Blu-ray is To Whom It May Concern: Ka Shen’s Journey, a 2010 feature-length documentary on the actress Nancy Kwan, one of Fate’s co-stars. Written, directed and produced by Twilight Time co-founder Brian Jamieson, To Whom It May Concern follows the life of Ms. Kwan, the daughter of a Chinese man and British women, from her childhood in both London and Hong Kong, through her rise to Hollywood stardom in the early Sixties in the films The World of Suzie Wong and Flower Drum Song, up to her later career in the Seventies and Eighties. Serving as a wraparound for Ms. Kwan’s life story is footage of her return to Hong Kong in 2006 to attend the Hong Kong Ballet’s premiere gala of the Suzie Wong: The Ballet. Jamieson effectively uses this material to draw parallels between the splintered lives of the Suzy Wong character and Ms. Kwan. Jamieson’s affectionate, informative doc is filled with extensive interviews of Ms. Kwan and others, vintage photos, clips from her films, and archival behind-the-scenes footage. It also includes comments from contemporary Asian actresses Vivian Wu and Joan Chen, both of whom acknowledge Kwan’s ground-breaking ascent in the industry. The Blu-ray is available from Twilight Time distributor Screen Archives.